During the Council, the Polish ecclesiastics would meet in extra-official gathering to exchange ideas about the goals of Vatican II. Cardinal Wojtyla was invited to chat with friends, young and old, who sipped chamomile tea in the apartment of Msgr. Malinski. The latter, in his book My Friend Karol Wojtyla, reports the words of the Cardinal of Krakow on that occasion. At right is the cover of the book. At right below, a photocopy of the French text. Below, we present our translation of the lines highlighted in yellow. Question - What problems will be oriented differently by the Council, Your Emminence? 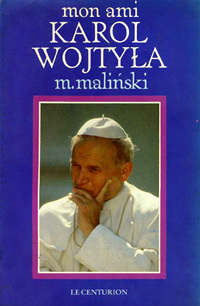 Wojtyla's Answer - Above all, it will serve to give more value to the authority of each Bishop and to promote decentralization within the Church, as well as to return to the principle of collegiality, re-evaluate pastoral methods in force until now, and effectively introduce new methods and ways - at times most audacious ones. There is also the question of the universal character of the Church; there is a change of attitude toward the ancient cultures of the non-European peoples. 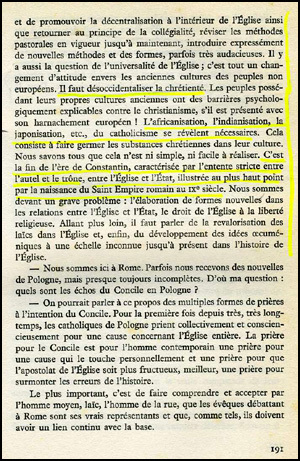 It is necessary to de-Westernize Christendom. The peoples possessing their own ancient cultures have understandable psychological barriers against Christianism when it presents itself in its European trappings! The Africanization, Indianization, Japonization, etc. of Catholicism reveals itself necessary. This consists of making Christian substances germinate in their cultures. We know that all this is neither simple nor easy to accomplish. It is the end of the Constantine era, which was characterized by a strict accord between the Altar and the Throne, between the Church and the State, illustrated in its highest point by the birth of the Holy Roman Empire in the 9th century. We face a grave problem: to elaborate new forms for relations between the Church and the State, the right of the Church to religious liberty. Going further, it is necessary to speak of giving new importance to the lay people in the Church, and, finally, to develop ecumenical ideas on a scale unknown until now in the History of the Church.